A common Question we get asked as Goalkeeper Coaches is, What Gloves are best for playing matches in wet conditions ? What Goalkeeper Gloves are the best for Wet Weather Conditions ? Just4Keepers @ www.goalkeepergloves.ie have designed & developed a Glove especially designed to perform at the highest possible standard during Wet Conditions during football matches. The Goalkeeper Glove we have designed is called the J4K PRO ADVERSE which has an aqua palm latex designed and made in Germany. The J4K PRO ADVERSE is worn by PROFESSIONAL GOALKEEPERS through out the world, and is the fastest selling Wet Weather Goalkeeper Glove in the UK & Ireland. 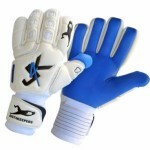 This Wet Weather Goalkeeper Gloves is Available for NEXT DAY DELIVERY all over Ireland.